1. Made up of fifteen LED bulbs.narrow.the lighting angle is 100-120 degree,big. used in various as direction,backup light. 2. Character: super bright LED, the design of anti-heat well, T20 wedge base, giving out green light from two layer. 2. Emitting color: super green. 3. Forward voltage unit: V: 13.2. 4. Totality luminous intensity unit: LM: 13.9/5.1. 5. 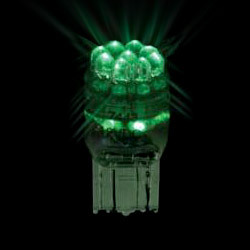 Single LED axial intensity unit: mcd: 18350. 6. Dominant wavelength unit: nm: 525. 7. Viewing angle unit: deg: 14. 8. Color temperature unit: K˚: 7500.